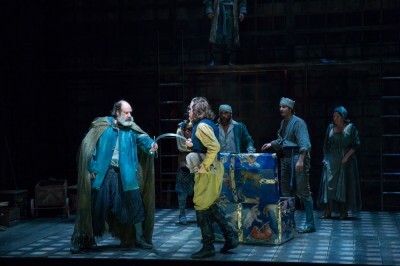 One of the swords in Man of La Mancha had to bend unnaturally as part of an effect. It needed to bend in a “U” shape then snap back into shape. Although the creative team had a particular style of sword in mind (a broadsword) it wouldn’t have to be a real sword, but would have to look like one to make this concept believable. 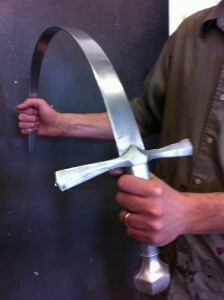 We did not find a sword that could flex this way, so I hunted for materials that might work to make one from scratch. I researched the physics of tensile strength (only half understanding), which led me to the brilliance of fiberglass. 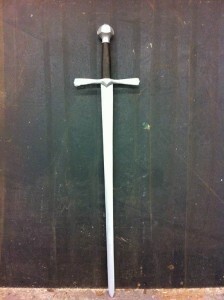 I found a company that sells structural fiberglass strips the thickness of a real sword. I removed the blade of a real broadsword from its hilt, traced it on the fiberglass strip and cut it out, sanded, beveled the edges and painted it to look like shiny steel. This worked the way they needed, but now I needed a hilt! If I had used the hilt of the real sword there was a great chance that, because it was made out of steel, the fiberglass would snap where rigid and flexible connected. 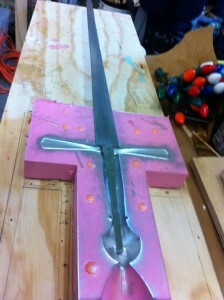 So we thought that making a mold of the real sword’s hilt in order to cast the hilt out of foam would work. 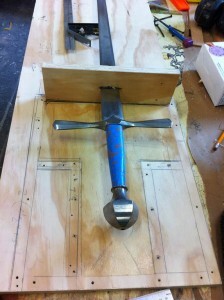 This involved making a two piece mold. 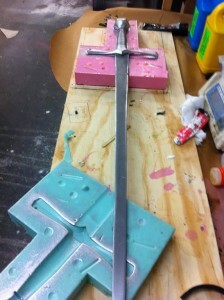 I would then pour rapidly curing special effects foam into the mold with the fake blade carefully placed inside, so that when cured, blade and hilt would be one. 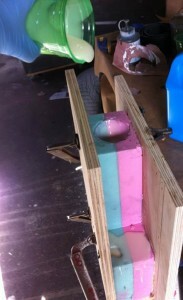 This foam is liquid, and starts to foam up quickly, expanding twice its size before it gets solid enough to take out of the mold and hold. 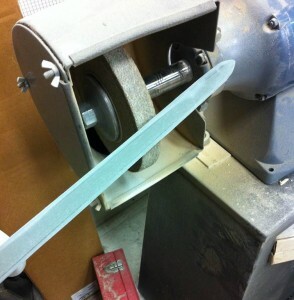 Figuring out this system means that I am able to produce more than one sword, in our shop, in a short amount of time. Dan Sharkey, Anthony Warlow, and the cast of Man of La Mancha. Photo by Scott Suchman. The finished sword makes an appearance near the top of the show—keep an eye out for it!